My Shingles have a black stain on them. 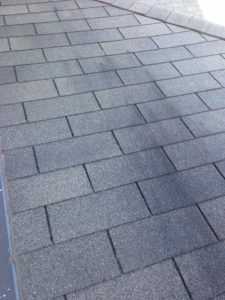 We wanted to know what causes asphalt shingles to stain like this? It is very unsightly when you look at our roof from a distance. The shingles were advertised as 25 year shingles and this is only year 14! They appear to be wearing normally. There is no curling at the ends or abnormal loss of the grit. We also are well ventilated so the attic does not overheat in the summer. It is unsightly and since we live at the end of the street, everyone sees it when they drive down our street. We wanted to know what was causing this and what we could do about it? Turns out that we live in an algae prone area. If you live in a humid area, there is a good chance that you will encounter this black algae on your roof. It is not harmful to the roof and will not cause your shingles to age prematurely. The stains are not everywhere on the roof. Anytime there is a metal flashing or air vent, the area just below them are free of the black stain. This is due to the metal from these items being washed onto the roof in very small amounts. You can wash the roof with chemicals to kill the algae, however it usually returns the following year. You may as well save your money. When it is time to replace your roof purchase algae resistant shingles to avoid this problem. There are several products on the market specifically designed to remove algae stains from a roof. These include Wet & Forget and Moss Out. A mixture of trisodium phosphate (TSP), bleach, and water will also remove stains. Oxygen bleach lightens stains as well and is less harmful to the environment, but it doesn’t produce as immediate or dramatic an effect as chlorine bleach. Be careful that you do not damage the roof each time you walk across it while applying the chemicals. For more information about removing stains, click here. This is everyone’s nightmare, red wine spilled on a white carpet. 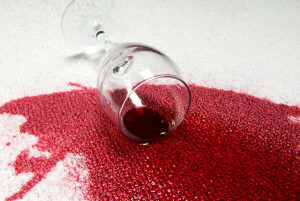 Everyone wants to know how to remove red wine stains from carpets and in their minds it is urgent. There is no question you need to move quickly to get rid of the red wine stain, but it is important to clean it up properly and not leave a long term red stain on your carpet. So what do you do to get rid of that red wine on the while carpet? Turns out is fairly easy as long as you act quickly and get to work on the stain. Using while paper towels is the first step. Blot as much of the liquid as you can being careful not to rub the wine in further. Step 1: As we mentioned the first step is to blot as much of the liquid up using paper towels being careful to not rub it in further. Step 2: Pour some cold water over the stain and continue blotting up the liquid. The water will dilute the wine and remove some of the color. Continue blotting as long as you are getting some of the liquid on the paper towels. Step 3: (Note – not verified by the writer, try on a test area) Mix baking soda and water in a three to one mixture. Apply it to the affected area and let it dry. Vacuum the next day and it should remove all of the stain. Step 4: If you do not like the idea of step 3, go to a hardware store. Purchase a stain remover that works with red wine. The spot will stay wet for several hours after steps 1 and 2. So you will have time to go to the store and pick up the product. If it is more serious or you’re not satisfied you may have to turn to a professional to have the stain removed. For more information on stain removal, click here. We recently spilled an entire cup of coffee with cream in it on our carpet just like it shows in this picture, but only larger. It was an accident that could have been prevented, but it is too late for assessing blame. We now have to focus on how to remove it. We talked to some friends, did a quick online search and also bought some stain remover from a hardware store. Whether we needed to do all of this is unclear, but the steps we followed based on the input we got, did the job and we want to share it with out readers. This is how to remove coffee stains from a carpet. Whatever you do, do not wait. Get started now and follow these steps before the coffee seeps into the carpet and starts to dry on the fibers. Step 1: Grab paper towels and begin blotting up as much of the liquid as you can. Do not rub the carpet. This could push the liquid further into the carpet and into the fibers. Step 2: Dish towels will also work, just don’t rub the carpet. Soak up the liquid as much as you can. Step 3: Take one cup of water and soak the area with water. Next use more paper towels and again soak up as much of the liquid as you can. The water will help to dilute the remaining coffee stains and help to remove more of the stain. Step 4: Mix two cups of warm water and a quarter cup of lemon juice. Step 5: Apply the solution using a sponge. Cover the entire area and gently sponge up the stain. Step 6: After use paper towels to soak up the water and more of the stain. The lemon juice acts as a mild acid to remove the coffee from the fibers. 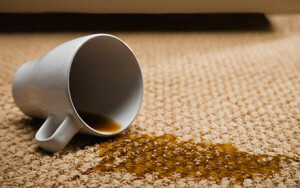 Do not use more than a quarter cup to avoid any long term change to the carpet. Step 7: Rinse the area with cold water and using paper towels to soak up any liquid and dry it as much as you can. Step 8: This step may not be required. We followed this step after we had completed the previous steps. we purchase a stain remover for carpets that specifically mentioned coffee. Follow the steps outlined on the bottle and remove any final indications of coffee stain. This worked for us and you would never know that we had spilled coffee on our carpet. For more information about removing stains, click here.